According to the Australian Department of Agriculture, Fisheries and Forestry, eucalyptus forests comprise 79% of Australia's native forests, covering nearly 450,000 square miles. Despite the abundance of eucalyptus trees, only a few species have evolved to utilize them as a food source due to the toxicity and low nutritional value of their leaves. Koalas are herbivorous, primarily arboreal marsupials of the eucalyptus forests. Perfectly adapted to dwelling in trees, koalas have five-fingered paws with opposable thumbs, which aid in gripping branches. Found exclusively in the coastal region of eastern and southern Australia, koalas have a narrow range defined by the presence of their only food source: eucalyptus trees. 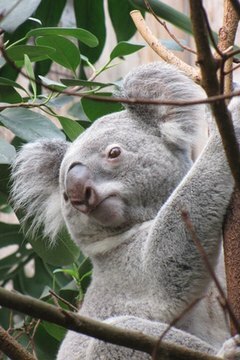 Few mammals are able to subsist on eucalyptus leaves due to the presence of toxic terpene and phenolic compounds, but the digestive tract of the koala has adapted to withstand the harsh chemical composition of the leaves. Due to the low nutritional value of eucalyptus leaves, koalas must spend at least four hours per day foraging for food. The greater glider is a small, nocturnal marsupial found in eastern Australia. The greater glider can grow to be 20 inches long with a tail of equal length, making it the largest specimen in the petauroides genus. The ability to glide over moderate distances is an important survival mechanism for gliders, made possible by a thin membrane that stretches between the fore and hind legs. The habitat of the greater glider is confined to areas of eucalyptus forest near a water source, where their preferred species of tree grows. The young leaves and flower buds of white mahogany eucalyptus is the preferred dietary source of the greater glider, which they forage for during the early morning and evening hours. The common wombat is the closest living relative of the koala, but is a predominantly terrestrial marsupial. Found along the southeastern coast of Australia and throughout Tasmania, the wombat shares much of its range with koalas and is often in direct competition for a favorite food source: eucalyptus leaves. Although grasses and roots comprise the largest portion of their diet, they often feed on the young leaves of eucalyptus trees, using their extraordinarily long and thorough digestive tracts to extract nutrients from the fibrous matter.